This page contains an overview of the books I've written. At this point I've only written one, but there's probably more to come. 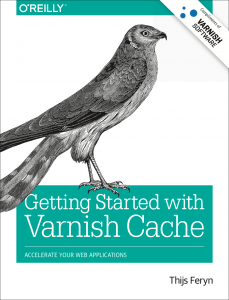 "Getting Started with Varnish Cache" is a technical book about the Varnish caching technology. Varnish is a so-called reverse caching proxy that acts as an intermediary between the browser and the webserver. Varnish stores HTTP responses and serves them to the browser, without accessing the backend for every request. This causes a massive speed increase. My book explains how you can get the most out of the software, by tuning either your Varnish configuration, or by optimizing your web application. The book is published by O'Reilly and can be purchased on Amazon, or as part of an O'Reilly Safari subscription. The book is a technical "getting started" book that targets web developers and system administrators. However it's caters to business needs and can be a great source of inspiration for decision makers (CTO/CIO) who care about web performance. In a saturated online market with plenty of competition, web performance is an essential part of the user experience. Users don't have any patience, and the slightest of delays will make them go elsewhere. Caching is a valid strategy that improves web performance. Why recompute, if the data hasn't changed? In this book I'll explain how Varnish works, how you can install and configure it, and how to get a decent hit rate. The power of Varnish is its built-in Varnish Configuration Language that gives users unparalleled flexibility to define caching policies.